Santander will pay $26 million to settle allegations that it gave high-interest loans to car buyers it knew could not repay them, a lending tactic that helped trigger the housing market crash nearly a decade ago. The settlement between Santander Consumer USA Holdings Inc., the bank’s subprime auto lending division, Healey, and Delaware Attorney General Matthew Denn marks the first agreement in the country over how banks financed these auto loans. Massachusetts will receive $22 million of the settlement, and Delaware — which joined Massachusetts in the case — will receive $4 million. Some borrowers will have their outstanding loans paid off as part of the settlement. Santander’s drive to capture a larger share of the subprime auto lending business, targeted at lower-income borrowers and those with bad credit, and the need to meet investor demand for these packaged and resold loans, led to relaxed standards and poor oversight by the bank, Healey said. Santander has implemented new controls and oversight practices in its auto-lending business, bank officials said. The bank noted that the alleged problems, which date from 2009 to 2014, are consumer protection issues and are not related to the reselling of the loans to investors. 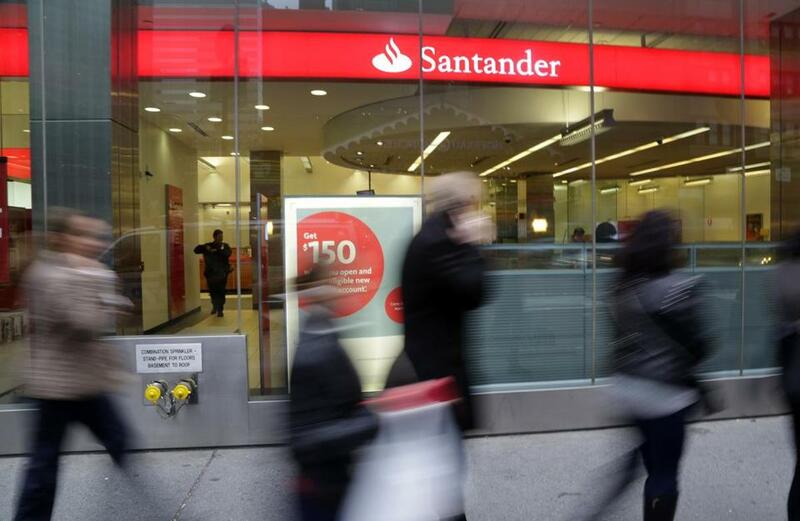 Under the settlement, Santander neither denied nor admitted wrongdoing. But some Massachusetts consumers who financed their cars through Santander said they are struggling. Kathleen Ann Boluch, 59, of Cohasset, bought her Chevrolet sport utility vehicle in 2012 from a local dealership after her old car was rear-ended by a drunk driver. She bought the $18,000 car with financing from Santander that carried an interest rate of more than 20 percent. Boluch said that when she told the car salesman that she was a freelance writer who did advertising work, he suggested she could help the dealership with its promotional work and listed her as an employee on her loan application. Boluch said she never got any work from the dealership and has instead taken odd jobs, from substitute teaching to baby-sitting, to help pay the $350-a-month car loan. Last summer, the car broke down, needing a new transmission that she couldn’t afford. She’s had to borrow a family member’s vehicle. Meanwhile, she still owes about $10,000 on her Santander loan. “I pay every month, but this loan does not go away,” she said. According to Healey’s complaint, Santander knew which dealers had high rates of borrower defaults, which exaggerated the value of cars, and even identified a group of “fraud dealers” who inflated borrowers’ incomes to get buyers into larger loans than they could afford. One dealer inflated borrowers’ incomes by at least $45,000 a year, according to Healey. Yet Santander continued to do business with those dealers and failed to rein in their practices, according to Healey. In some cases, Santander required that some dealers buy back loans that had defaulted, she said. Healey declined to comment on which dealerships falsified or inflated loans to consumers in Massachusetts, but said her office is conducting an ongoing investigation of other lenders and auto dealers. Auto lenders have had little incentive to ensure that consumers are in loans that they can afford, said John Van Alst, an attorney for the Boston-based National Consumer Law Center. Nearly a quarter of the $1.135 trillion in outstanding auto loan debt nationally involves subprime borrowers. These loans can be riskier for investors but offer the potential of higher returns and were attractive in recent years in an otherwise low-interest rate environment. For Santander, the largest packager and seller of subprime auto loans, it was also an important part of its business. But in recent months, there have been increasing signs that the subprime auto loan market is weakening, with more delinquencies. According to the New York Federal Reserve, in the third quarter of 2016, delinquencies among borrowers with low credit scores hit 2 percent, the highest level since 2010. The subprime market — and Santander in particular — is also coming under greater scrutiny. Earlier this month, the Federal Reserve told Santander to strengthen oversight of its subprime auto-lending unit because it continues to fall short of state and federal consumer protection laws. Santander is owned by Spanish financial giant Banco Santander and in recent years has struggled to meet US regulatory standards. Last month, the Office of the Comptroller of the Currency downgraded the bank’s rating in community lending. The bank has also failed a portion of the Federal Reserve’s stress test three years in a row. Under the settlement with Healey’s office, more than 2,000 Massachusetts consumers will share $16 million in relief. Besides the payments to borrowers, Massachusetts will get an additional $6 million from Santander to settle the allegations, according to Healey. For Andy Wilkinson, 29, of Freetown, the settlement will likely help offset the payments he has to make for a Chevy Impala he bought in 2011 to drive to North Carolina for Army medic training. But the deal still feels unsatisfying, he said. Wilkinson said that after he returned from Iraq he had to get knee surgery and asked Santander for a deferment on his car loan, since he would be out of work for a few months. Santander never told him that his request had been denied and when he wanted to restart payments, he discovered that his loan had been sent to a collection agency and his credit was ruined. It has taken him years to repair his credit. The car he bought no longer works, but he still pays nearly $300 a month on the loan.